Is it good to hold your breath for long periods of time? If you hyperventilate before going under you will artificially reduce the CO2 levels in your blood. CO2 is the trigger that makes you want another breath. If your O2 level in your circulation goes below the level required for consciousness before the CO2 trigger kicks in... you are in real trouble. I hope the exercises suggested on this blog would only be attempted in a pool attended by a lifeguard. In answer to your original question, though I'm not a medic, I don't think there's any long-term damage from short-term hypoxia. As long as your brain gets enough O2 within 8 minutes you should suffer no long-term damage. Well, holding breath for long time could be good and bad. It depends how far you are willing to go and what do you want to achieve. Of course, you should not hold your breath until you see stars in front of your eyes. Just long enough to feel a little discomfort. The positive side of the story is that you will increase your lung capacity by using your lungs more and more. Hyperventilation is good, but only in moderation. I'd suggest to take only about 2-3 deep breaths before attempting to hold breath for a long period of time. Any more than that is not a good practice. As suggested in the comment above, if you are not a skilled competitive swimmer (who this post was meant for), please do not attempt to hold your breth for a long period of time in a pool without proper supervision (lifeguard, swimming insructor etc.). I was trained to breathe per stroke. When I started swimming I used to do like 5 strokes then breathe. Definately not good, I was dead by the end of the lap. 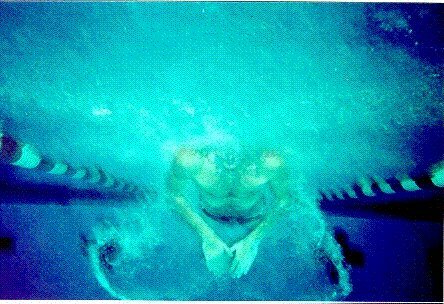 By breathing once per stroke, I kept my heart rate down, could do slower and more powerful strokes. Hypoxic= the word every swimmer fears his coach will say. nice set. Keep it up Jono. Try it backwards, 9,7,5 and see how it goes. I disagree with the whole article, it's totally false. The fact it mentions 'improve lung capacity' in the title tells me enough. You can improve lung function, but, surprise surprise, not by holding your breath. But it's not just in competition, we all know you're not going to do something on race day you haven't done in training. to andrew webber: thanks for sharing your criticism. Fair enough, the title is unfortunate as one cannot increase lung capacity in a physical sense. However, the outlined exercises are just a few of many which can help increase lung efficiency, so it is not as misleading if you don't take it literally. Since you mentioned you disagree with the entire article, would you have some suggestions on improving the contents? I always want to learn more, so please don't be shy. to andrew webber: you are spot on regarding the need to practice race technique and race conditions during practice.